Emergency Towing - All American Towing Inc.
All American Towing delivers fast response with our industry leading 24-hour emergency towing in Louisville, Kentucky. We offer an all-day & all-night service to reflect the unpredictable nature of vehicle emergencies which ensures that you aren’t left without an emergency towing operator in your moment of need. Just as quickly as you know you need assistance, you want a towing company to arrive on the scene as fast as possible. This is precisely why we here at All American Towing offer 24-hour emergency towing in Louisville with a guaranteed 24/7 response time. When we say we are a 24 hour emergency towing provider, we mean it – “all night services”!. Servicing the greater Louisville area 365 days a year we bring the right equipment to handle your tow or extraction. Call us for emergency towing and roadside assistance that will be with you usually within half an hour, rain or shine, each day of the year. Let’s face it, there’s never a good time to break down on the road. Whether it’s on a city street, suburb or highway we know it’s a very stressful time for any driver and All American Towing is here to help. 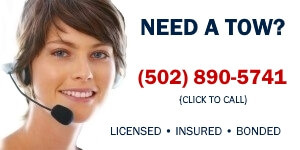 So no matter where you’re driving in and around Louisville, Windy Hills, Indian Hills, Graymoor-Devondale, Prospect, Hurstbourne, Douglass Hills, Anchorage, St. Matthews, Lyndon, Pioneer Village or even further out; trust our team of expert Tow Truck operators to help you secure your vehicle quickly and affordably.